tDCS and rTMS: Is brain stimulation safe and effective? A new technology promises to supercharge your brain with electricity. Is it too good to be true? 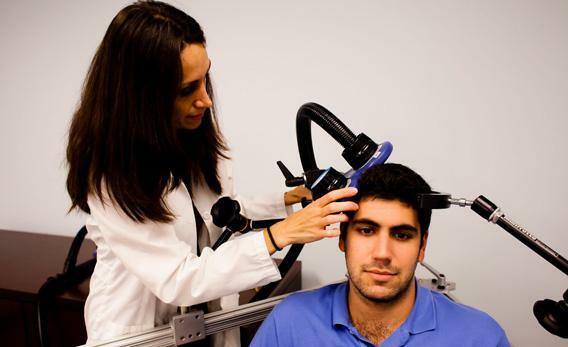 A doctor demonstrating a technique called transcranial magnetic stimulation, which affect neurons in the brain. Scientists have rediscovered a centuries-old procedure for supercharging your brain. Depending on how it’s used, it could improve anything from focus to motor control to mathematical or even moral reasoning. It’s simple. It’s relatively cheap. The known side effects are minimal. And it’s so easy that you can do it in your own home, anytime you want. All you need are a pair of electrodes and a power source. Happy April Fools’ Day, right? Maybe. Incredible as it sounds, though, every claim in the paragraph above has been supported by experimental evidence. The procedure is called transcranial direct-current stimulation, or tDCS, and the idea has been around for 200 years, though it languished in disrepute until recently. The setup: You attach one electrode to your scalp above the part of the brain you’re trying to stimulate, and another electrode on the other side of your head, to complete the circuit. Then you turn on a milliampere or two of juice, and watch the mental sparks fly—figuratively, if you’re doing it right. Applying them to the motor cortex can raise your threshold for pain and make you more adept with your nondominant hand. Position them above the posterior portion of the left perisylvian area (in right-handed people) and they can facilitate language acquisition. The potential applications for tDCS (and a related technology called repetitive transcranial magnetic stimulation, which uses magnets to induce a current) range from healing to educating to killing. Doctors are experimenting with tDCS to treat severe depression and help stroke victims regain their speaking skills. Students in theory could use it to solve math problems or pick up Russian. Air Force researchers are using it to make people better at guiding killer drones, and DARPA has found it could improve snipers’ marksmanship. A few studies claim results that are even more jaw-dropping. In Neuroscience Letters last year, Australian researchers reported applying tDCS to 33 people as they tried to solve the notoriously tricky “nine-dot” logic problem. Not one was able to crack it without stimulation, or with “sham” stimulation (in which electricity is applied only briefly to mimic the feeling of tDCS). With current coursing between their left and right anterior temporal lobes, 40 percent solved it. Exactly how all of this works is not yet fully clear. But the process appears to make neurons in the stimulated area more malleable, so that new connections form more readily while under the influence of the current. It remains to be seen whether those changes are short-lived or enduring, but at least one study has found positive effects persisting for up to six months. The beauty of it, in theory, is that the electric current doesn’t rewire the brain on its own—it just makes it easier for the brain to rewire itself. At this point it seems obvious that this is far too good to be true. So what’s the catch? The catch is that we don’t know what the catch is. And to Peter Reiner, a neuroscientist at University of British Columbia, that’s a biggie. If tDCS can so quickly change the brain in ways that we can easily measure, he says, there’s a good chance it could also change the brain in ways we can’t easily measure—or that researchers so far haven’t tried to measure. Scientists often assume they can target the effects of tDCS by stimulating only the part of the brain relevant to the task that the subject is concentrating on. But most would admit there’s some guesswork involved, since brain topography can vary from one person to the next. And Reiner warns that there’s no guarantee the subject’s mind won’t wander, say, to “something horrific that occurred earlier today.” What if tDCS ends up forging traumatic connections along with useful ones? Less dramatically, it seems plausible that researchers are overlooking subtle drawbacks of tDCS. One of the first papers to identify downsides to the procedure was published last month in the Journal of Neuroscience, titled “The Mental Cost of Cognitive Enhancement.” Subjects who had their parietal lobes stimulated during a numerical-processing task performed better than those who received fake stimulation. But a week later, they struggled to apply the newly learned techniques to a different task. “They had trouble accessing what they’d learned,” study co-author Roi Cohen Kadosh of Oxford told Wired. Subjects who had a different region of their brain stimulated during the task showed the opposite effect, performing slowly at first but better at week’s end. An observant YouTube commenter pointed out that the young man had reversed the anode and the cathode, a mistake akin to putting the wrong jumper cables on your car battery. “Flip it around and try again,” the commenter suggested. The fact that tDCS may pose unknown risks, that its benefits and drawbacks are not yet fully understood, that it can be dangerous in the wrong hands—none of these arguments should keep scientists from carefully exploring its potential. Having spent the better part of two months immersed in the vertiginous world of human enhancement, I’ve become convinced that societal and academic taboos against the use of technology to give healthy people extraordinary powers are, on the whole, counterproductive. College students are already popping Adderall in droves. Body hackers are implanting microchips in their bodies. Entrepreneurs are hawking tDCS kits for $99 online. Some athlete, somewhere, is probably experimenting with gene doping. The riskiness of some of these behaviors makes it tempting to simply outlaw them all and expect everyone to comply. But that’s as unrealistic as it is blinkered. Maybe he’s wrong. But I’ve talked with enough academics over the past two months who flat-out refused to even discuss the potential use of various medical technologies for human enhancement—or to even have their name attached to an article that discusses them—to suspect that there’s some legitimacy to his paranoia. Too many people seem to think that humans are fine the way we are, and that the only proper use of these technologies is to restore “normal” human functions to people with disabilities. I’m skeptical of a lot of the advertised merits of tDCS as a wonder tool for cognitive enhancement. After all, the modern field is still young, and it’s always easier to get research published and publicized if a result is dramatic. Already one study has cast doubt on the use of “sham” stimulation as an effective control for tDCS experiments. Perhaps it will take a backlash like the one against ADHD drugs to spur studies that debunk some of the more outlandish positive results. But we should resist the urge to demonize either technology just because they feel wrong, or like cheating, and so to close the door to progress. What if it turns out that something like a tDCS “thinking cap,” goofy as it sounds, could not only make us sharper but help us to exercise greater self-control or make better decisions under pressure? Is that really possible? Would it be safe? Let’s find out! And until then, I’ll join the chorus: Kids, don’t try this at home. Read more from this series: Human enhancement is giving us superpowers once reserved for comic-book heroes; technology is expanding our minds; brain-computer interfaces let you move things with a thought; choose your own sixth sense; steel yourself with a robotic exoskeleton; is China engineering genius babies? ; and do smart pills really work?